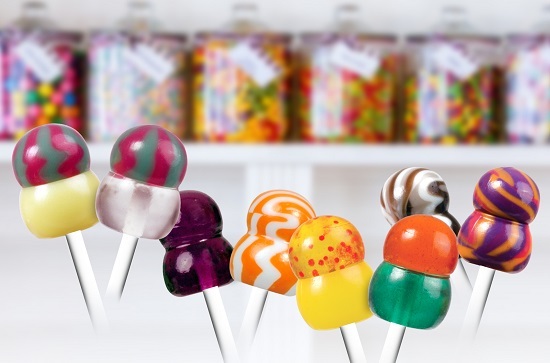 The addition of soft-centred double-ball lollipops to the capability of Baker Perkins' ServoForm™ depositors extends the diversity of product concepts in the lollipop sector. This new option creates opportunities for innovative lollipops with contrasting textures. Centres such as chocolate, jam, jelly, fondant, gel or soft toffee can be surrounded by a hard candy outer, and there are virtually limitless potential varieties of colour and flavour. The concept of soft-centred single-ball and flat lollipops has been around for some time. What the development of a double ball version adds is the opportunity to combine two lollipops into one. For example, a soft-centred ball joined to a standard, hard-filled or even another soft-filled ball to enable a range of truly unique products to be created. This is an extension of depositing technology that is already well proven for making hard candies with soft centres and lollipops with hard centres. Soft centre lollipops can be made by only the depositing process because of the extreme accuracy of deposit and stick placement required. Existing ServoForm™ depositing systems can easily be adapted to take advantage of this new capability, and customers can develop new products in the Baker Perkins Innovation Centre at Peterborough. The development continues Baker Perkins’ extension of the lollipop product range. Single-ball, double-ball and flat lollipops with up to four components may be deposited in an infinite variety of stripes, swirls, layers and flavours; and with inclusions and hard or soft centre-fillings. Sugar-free and sugar options are also available. Superior appearance, high clarity and rapid flavour release are key quality advantages of depositing. The nature of the process creates complete control throughout the system, leading to extremely high dimensional, shape and weight accuracy; negligible scrap rates and efficient wrapping; plus maximum hygiene with low maintenance.